Legal regime related with land rights in Bangladesh is extremely anti-poor and a source of vicious circle of poverty. The language of land laws are frustratingly written in a cloistered language making access to land by the mass people almost impossible. Majority of the land laws carry the legacy of the colonial yoke and are not devoid of landlord syndrome in asserting land tenure and rights. As a result, land right of the common mass is often left at the mercy of a feudal and discriminatory system. Empowerment of common people is, therefore, shattered by the sheer bite of poverty. Land disputes create an environment for exploiting the innocent people and multiply the process of pauperization. It is true that the whole court structure and justice delivery system is responsible for delay in disposal of litigation or settling disputes. But the unreasonable procrastination in land disputes, the complex, long and vague land legislations are not less responsible. Land laws become the cause of frictions than solving them. Francis Bennion sarcastically yet rightly said: “I'm the parliamentary draftsman/I compose the country's laws, /And half of the litigation/I am undoubtedly the cause”. In the successive paragraphs I am picking up certain areas of land law and trying to establish their inefficacy to establish access to land by the mass people. There goes a Bangla saying like this: 'Deshe Elo Jareep, Manush Holo Gareeb”! The simple translation in English may be: 'with the appearance of survey system, people reduce into poor.' The land survey is the process by which the record of rights is made. The survey does not take place regularly. It is very archaic in nature, takes a long time to finish. The elongated process and inadequate redress against wrong record of land proves to be deprivation of one's holding. The land record system in Bangladesh is archaic, obsolete, illegible and an impression of complex labyrinth of land rights. The record of rights is the subject of forgery and a means of calculated deprivation to land rights particularly of the helpless and downtrodden. Ceiling is the amount of land a person or his family can retain lawfully. 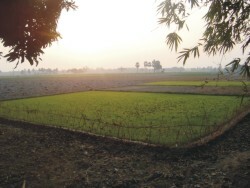 As per the prevailing law, a person or a family can possess maximum 60 standard bigha agricultural land with certain exceptions. In practice, the exceptions govern the system and people become owner of land much higher than the stipulated ceiling. The existing ceiling system is grossly flawed and twisted on the following grounds: I. The definition of family is subject to intense debate. The inherent problem lies here is that same amount of land is allowed to hold by a family irrespective of its size. II. A person is debarred from acquiring more than 60 standard bigha but a person who already possessed more than 60 bigha was not dispossessed from the surplus land. This is inherently discriminatory. III. The value of land in urban area and rural area is not same. The ceiling applies in the equal manner for both types of land. As a result it proves to be unrealistic, and pro-capitalist. Law of acquisition is surrounded by politics of development. Most holdings of the people are acquired in the name of developmental activities and are put under the garb of 'public purpose'. The major legislation on the point is 'Acquisition and Requisition of Immovable Property Ordinance, 1982', which was promulgated by a military ruler. The law epitomizes the Austinian syndrome of legal definition and appears to be an unreasonable compromise with fundamental right to property of the citizenry. From Kaptai to Arial Beel we get the same impression. There are several concerns in the acquisition process. Firstly; in assessing the compensation the opportunity cost is never taken into consideration. Therefore, the legislation does not qualify the constitutional test of providing 'adequate compensation' for its validity. Secondly; in the absence of standard resettlement policy any acquisition and requisition scheme is bound to collapse bringing a malady consequence for human rights. Thirdly; effective redressal forum for grievances is a foremost prerequisite for a sound law of acquisition in order to check malafide acquisition and deceptive compensation package. An overburdened district judge or joint judge acting in the capacity of an Appellate Arbitrator or Arbitrator can hardly perform as quick, effective, competent redressal forum. Access to no remedy, therefore, is enough to vitiate the pious purpose of all the acquisition proceedings. Rights of the Bhag Chashis (Sharecroppers) are a historical component of denial. The legacy of land laws in the sub-continent reveals that the sharecroppers got no right in the famous laws purported to ensure the rights of the farmers. The notorious Permanent Settlement Regulation, 1793 awfully neglected the rights of the raiyats, let alone the sharecroppers. The successive legal regime related to land law, Bengal Tenancy Act, 1885, for example, failed to protect the rights of the under-raiyats. Even the most pro-peasant law, namely, The State Acquisition and Tenancy Act, 1950 didn't mention the name of the sharecroppers in the garb of a uniform class of tenants under the government. The increased number of landless people necessitated the changes in the ceiling system within remarkably short time in 1972 and 1984. The LRO of 1984 in line with decreasing the amount of land ceiling also prescribed some written protection of the rights of the bargadars. This was first of its kinds in Bangladesh to give written protection of the rights of the sharecroppers. The LRO of 1984 was an impression of crocodile tears by a military ruler for the landless peasants. Therefore, in the long run the law appears to be clumsy to defend the rights of the poor sharecroppers because of not reflecting the justice syndrome in the letter and spirit of the law. The politics of charland is yet another cause of human catastrophe in Bangladesh. A considerable portion of land in the country is submerged in the river each year. And a huge number of char emerge in satisfaction of the submersion. The legal literature has addressed the issue as 'shikasti' and 'pawsti' of land or alluvion and diluvion law. Carrying the legacy of colonial provisions, these laws once again have failed to ensure the restoration of the ownership of the original owner. Loosing the land in river erosion is a journey from ownership to impoverishment. This is fortified by the enfeebled legal protection by alluvion and diluvion law. The looser fights to retain the reappeared land as he finds himself dispossessed. The displacees suffer from lose of quality of life. Their future becomes insecure. Erosion creates significant changes in the affected people's psychology. They see only decay.This picture of poverty fatalism is the permanent customer of socio-economic milieu of river erosion induced displacees in our country. This is perhaps the existing thatched of poverty of what Professor Amartya Sen has called 'capability deprivation'. Bangladesh constitution inscribes justice as the first promise of the Republic i.e. State Power will execute the pledge of 'Justice' in favour of the millions who are the Republic. Perhaps the existing land laws can best be termed as state's efficient camouflage of depriving the fundamental human rights of the masses by providing effective tools to the haves of the society. Land was never a serious reform issue here, the changes in the legal corpus related to land has always been brought merely to make the power base more strong, firmly footed and unchallengeable. Rights of the people are marred in the sly valley of legal language. It becomes very tough to get the 'rights' in the 'law' of 'land law'. Hence, it is fair to conclude that the 'law' less law is becoming an instrument to make the people impoverished. Because, 'any law which violates the indefeasible rights of man is essentially unjust and tyrannical; it is not a law at all'. The writer is Assistant Professor of Law at Jagannath University.